I saw that a good number of folks were getting cards signed from 2018 Heritage Minors and 2018 Bowman, so I wrote down a couple names of guys that I had seen successes of, and put together a couple TTM requests. 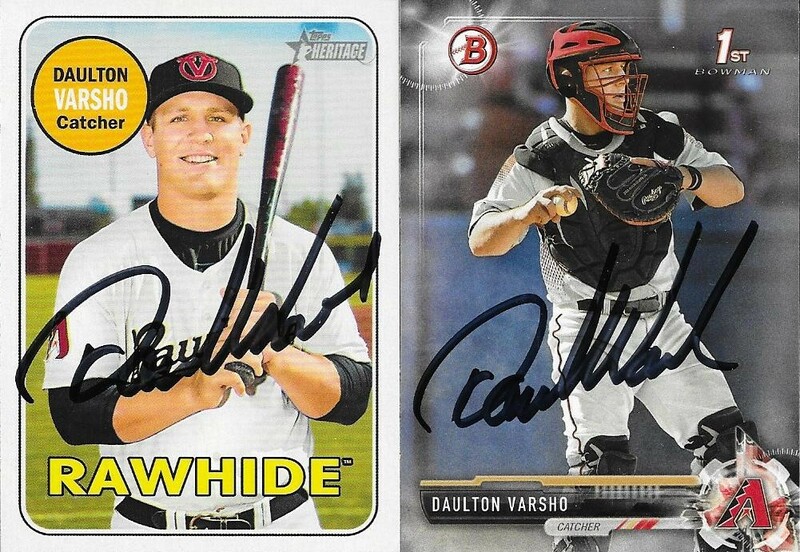 One of the ones that came back was this really cool success from Daulton Varsho. I was especially happy about this 2018 Heritage Minors Deckle Edge card. He inscribed it to me, and signed in black Sharpie. No, that's not a real autograph below it in blue. I also got his 2018 Heritage Minors base and 2017 Bowman Draft signed. Varsho (b. 1996) was drafted by the Diamondbacks in the second round of the 2017 Amateur Draft out of the University of Wisconsin. So far, he has 153 hits, 19 home runs and a .301 batting average along two minor league seasons. 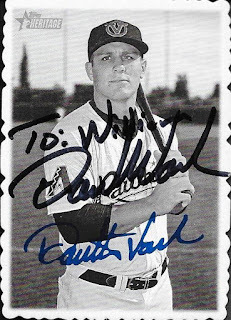 I mailed to Varsho on January 5 and got the cards back on January 18, for a 13-day TAT.